Noted that there is just two left in the Ust'Mafzal group. I have been thinking of joining one of the groups, but have been hesistant if I have the time to partake. So... would it be interresting to have one of my Illhardo characters joining the Ust'Mafzal? I got Aara'toskr and Roon'vos and their sisters (not yet introduced) of the Han'dai Val'Illhar'dro family. Weapons can be discussed. Ust'mafzal, unfortunately, may be disbanding for the time being as their leader doesn't have the time to continue with the squad at the moment. 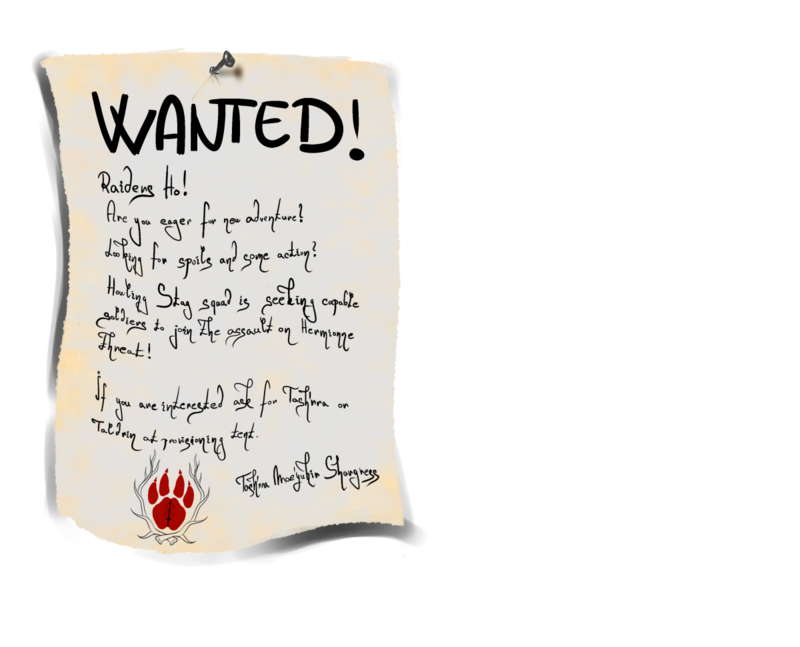 However, you could join Stormfront with a Sharen/Illhar'dro character as they're looking for a new squad member. Alternatively, you could contact kingpower (another still active member of Ust'mafzal) and three other people and form a new Sharen squad. Sadly, you'd be joining us too late to take part in the group commission we had Kern make, but if things go well for us and my monies, there may be more in the future! Hi, I have been talking with Isaiah Cortez during the stream today. He sounded positive. I gave him my email address if you want to go on to take my character in. I think Aara'toskr would be the best applicant for the team. Roon'vos is a bit to young and green for this. He ('Toskr) might although be able to get into the fray. He is fast when riding his warbird. He has already been in Felde - and you have only got to the perimeter of Felde. Anyways, I will await your reply. Weapon is the only issue. If you want your character to be a Mana user, their weapon can't be ranged, but instead be a one handed weapon of some sort. My character uses a short sword and our medic uses a Naginata. A weapon with long reach would make mounted combat easier, but a short one would allow for easier close combat. Here is the character sheet of Aara'toskr - without any corrections for him as a Relic hunter. Kern took away his axes and kept the knives. Also his empathy was changed to water (as Kern missed that he had a Sullisin father) -no problem really. Ah' yes, he was born on the surface in the Illhar'dro colony of Saosh, so he is a dokkalfar. As I understand his uniform has to be changed to Sharen, was it? And I suppose no fur cape. About the double axes - here is a link. The axes would be about 1,2 meters long carried crosswise on his back. He might be comfortable with a single axe if needed - as he would have no Arshin war bird in these campaigns. What else has to be corrected? Aaaaaand, his backstory is three pages long if anyone is interrested. •	Martial ability: Martial art in hand to hand combat – (dual) horseman’s axes for bird back fighting. He is also skilled in knife battling (carried hidden in his clothing). •	Mana affinity: Oh, so difficult. I would prefer empathy combined with traditional water affinity (bad in the Under World – good in the Old World). If not possible only empathy. •	Uniform: Traditional Illhar’dro uniform with a cape of thick fur (maroon) and Arshin war bird feathers in orange (he is only wearing the cape when appropriate). His favorite colors can also be seen in a scarf in his uniform. •	Civil costume: Maroon and orange are his favorite colors. And did I mention fur? He’s quite a clothes snob; His fancy for the moment is the Jie’yen McHammer pants (as Layani’s in chapter 34 page 9) with tribal patterns on the lower parts in his favorite colors. •	Colors: Traditional Illhar’dro blue eyes. Dokkalfar brown skin. Hair is dark blue of Vel’Cahal – in ‘Goddess Knight’ (if possible due to him being a dokkalfar, otherwise white hair). Hair in one ponytail bound up as Sandaur’s hair, but a striped band in his favorite colors. Tip of ponytail is white, also white slings of hair in front of ears. Maroon colored beads in his hair like Rei'shiid’s war bird, one behind each ear short tufts of white hair sticking out in the bottom. 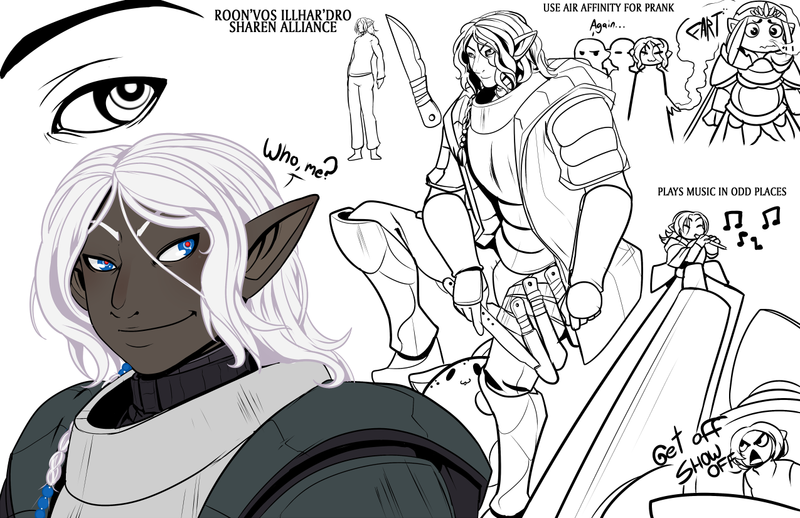 •	Size: As a male dokkalfar he is longer than a normal drow female. I would say imposing. •	Personality traits: Alpha male. Flirtatious to males and females. Clothes snob, following the latest fashion. Likes shopping and has a desire to check out new places for inspiration. So he can appear to be like a siyah'khorshed to many people that don’t know him. •	Favorite saying: We are equals (to females). We are as good as them (to males). Innuendos for the older men and his peers. •	Quirks: Openly gay, with a piece of bi – he will want to have heirs so he is not put of to girls (in his age – not elderly women). He prefers elder men (but dislike the feminine or submissive types) but takes what he got of his own age. He often get bad reaction from the males, therefore is happy when he get an opportunity to befriend a Sullisin warrior. He has a harem of “fag hags” around him in Nuqrah. Layani Vajdya Val’Illhar’dro is not one of them, but the sort of girl he would like to befriend closer. Of male peers, well Khal’harror and Nau’kheol (oh, he likes fur too) fits the bill if they were not too young for his true liking. He doesn’t mind testing the boys even when he is not serious (he is as I have said flirtatious). He is very fond of roasted chestnuts (from his family’s orchards). •	Character flaws: Alpha male (not good when preferring elder men) and living in a matriarchal society. Sometimes pushes his equal rights agenda a bit too hard. As he is known for this and of having sympathies for Sarghress commoner rule – he is regarded with suspicion by traditional Illhar’dros (looking on him in best case oddly in worst case as a potential traitor). He therefore has problems rising in the ranks as his competence would give him credit for. Elder women looking for young studs scare him – especially those who remember young Sandaur (in bed), he does not like the innuendos of that. He doesn’t like to take as he gives. •	Inspirational pictures: hopefully the back story will suffice. •	Name of his Arshin war bird is Moona. Looks great, sadly long bios don't actually matter much, because Relic hunters relies even less of backstories than even cameos. The only decisions now would be rather he's a Weapon or Mana specialist. Mana would be easy enough, as its whatever affinity he is(Singular one) in your mind with us already having Shadow and Blood affinities. With weapon, your axes would be good though you could only have the one. We have a tank and a ranged fighter in thus regards, so with a lighter weapon, you would be more a middle ground, or if you go for something more akin to a battle axe, a tank alongside our current one. Once you have that all figured out, you just need to set up your subscription, make your character build on Relic Hunters and then apply to our squad there and you'll be in and good to go! Any time a new member joins a squad mid-mission they just teleport in and everyone pretends they were totally there the entire time stop lying. Our current medic came in mid-first mission and was just appeared the next update without mention of her magical appearing act. Disestablish wrote: Looks great, sadly long bios don't actually matter much, because Relic hunters relies even less of backstories than even cameos. The only decisions now would be rather he's a Weapon or Mana specialist. Mana would be easy enough, as its whatever affinity he is(Singular one) in your mind with us already having Shadow and Blood affinities. With weapon, your axes would be good though you could only have the one. We have a tank and a ranged fighter in thus regards, so with a lighter weapon, you would be more a middle ground, or if you go for something more akin to a battle axe, a tank alongside our current one. I have now payed and applied to join Stormfront. Araa'toskr is riding his bird as fast as he can. He knows the way by now, traveling it for the third time in just a month. I choose mana specialist with empathy as ability. That was what I wanted him to have from the beginning. Weapon is a sword. Are you eager for new adventure? Howling Stag squad is looking for capable soldiers to join the assault on Hermionne threat! if you are interested ask for Tash'rra or Taldrin at provisioning tent. *on the bottom of the note is a simple drawn "seal"
Alright. This thread's not seen use in a couple years. Since Relic Hunters is coming to an end, I'm taking it off of sticky and movin' it to the Relic Hunters section.